Crayford was combined with other local areas to form the London Borough of Bexley in 1965. Crayford has a long and interesting history. The area was first mentioned in the Anglo Saxon Chronicle (c.891 - 924), which states that the Britons fought the Jutes at the Battle of Creganford in 457. 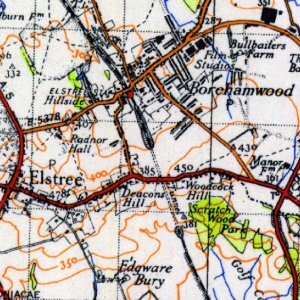 The Domesday Book (1086) records that in Crayford "there is a church", implying that there was a well established settlement in the area by that time. The Norman Church of St Paulinus, which still stands on top of Crayford Hill overlooking the town, was built in 1100. The original stimulus for settlement in the area was the fact that the River Cray could be forded at this point - and "Cray-ford" became the settlement’s name. Crayford Manor House stands just to the north-west of St Paulinus Church, probably in roughly the same position as the first manor house, which was established in the 14th century. Crayford actually contained two manors, those of Howbury and Newbury. 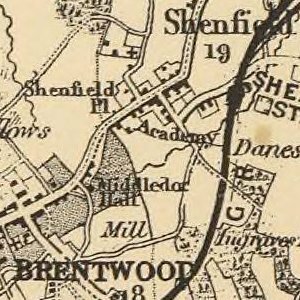 Several large houses once stood in the area, including Oakwood, Shenstone and May Place. 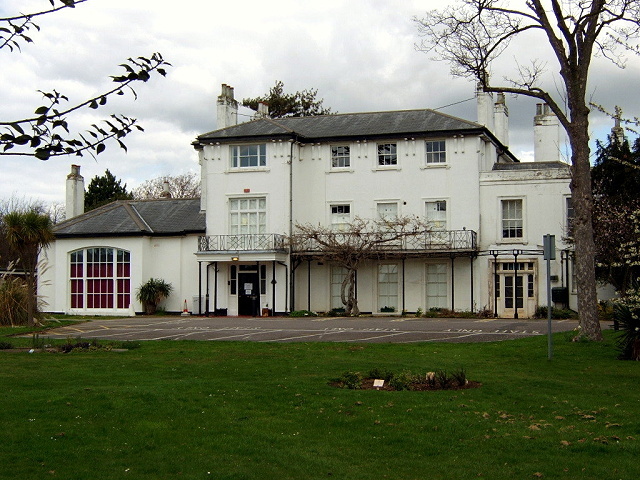 Little evidence remains of these, although part of the last house called May Place is now incorporated into the clubhouse of Barnehurst Golf Course. The house was for many years the seat of the lord of the manor and between 1694 and 1707 was the home of Sir Cloudesley Shovell (1650 - 1707), Commander in Chief of the Navy who took part in the capture of Gibraltar in 1704 during the War of the Spanish Succession. Three years later, after his ship the Association was wrecked off the Isles of Scilly, he was strangled for the rings he wore, by a fisherwoman. The presence of the river in the town led to the growth of industries such as tanning and silk-making, which need a constant supply of free-flowing fresh water. The tannery has long since gone, but the silk-printing works of David Evans Ltd, established in 1843, remain in the town. Swaislands was another long-established local printing firm. It was taken over by GP & J Baker who closed the works only in 1961. In the early years of the 19th century the huge armaments firm Vickers, originally from Sheffield, moved into the area. In the few short years of the First World War Vickers’ workforce grew from 300 to 14,000. Vickers built an estate, the Crayford Garden Suburb, to the east of the town to house the armaments workers. Whilst all that remains of the Vickers factory today is the clocktower, surrounded by modern retail development, the houses are still very much in evidence and are sought after as homes because of the quality of construction. 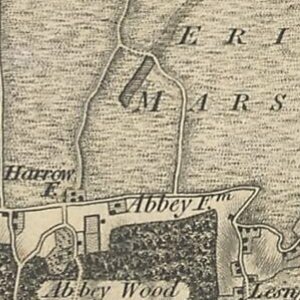 This area, which borders on Dartford and the County of Kent, became known as Barnes Cray after a prominent local family (the Barnes). Other industries in the area included barge building in Crayford Creek, brickmaking and motor-car production by the Siddeley Autocar Company, which had its registered works at Crayford in 1902. After the First World War the production of armaments was reduced, but industry continued to thrive and the local community prospered on the trade brought to the area as a result of the influx of workers during the war. The Princesses Theatre, opened in 1916 on the riverside, was built specifically to entertain these workers but unfortunately burnt to the ground within six months. It was subsequently rebuilt to exactly the same specifications but presumably with improved fire-protection measures! In 1920 Crayford became an urban district. As in most other local areas, the 1930s saw a period of busy housebuilding, although this was perhaps not as extensive in Crayford as it was elsewhere. Houses were built mostly by local builders such as New Ideal Homesteads and W.H. Wedlock. The population in the urban district almost doubled in the 20 years to 1951, from 15,896 in 1931 to 27,950 in 1951. Housebuilding was interrupted by the Second World War, which affected Crayford badly because the presence of the Royal Arsenal nearby (see Thamesmead) and of the armaments works in the town made Crayford an obvious target for enemy bombers. The town of Crayford today revolves around the retail trade, and has a large Sainsbury’s hypermarket at its centre. It is home to a substantial commuter population, who travel to London and nearby business and retail centres such as Bexleyheath and the newly opened Bluewater shopping park near Dartford.